Most of these collages are for sale for $300-$400. Available in print in either of two sizes, 8"x10" print, matted to fit in an 11" x 14" frame for $35, or 13" x 19" print matted to fit in an 18"x 24" frame for $45. Scroll down to see larger versions of these collages. "Living a complete life is drinking our cup until it is empty, trusting that God will fill it with everlasting life." This collage in its wood frame measures 11"x 14". The bowl and base of the chalice are suggested by curved torn metallic papers. The stem of the chalice is formed by the vertical beam of the cross. Available also in print and card form. "Make the Eucharist the heart and center of your life. It's there that you receive the love that empowers you to take the way . . . that gives you true joy and peace and enables you to make the non-violent love of God visible in the world." The text is hand-lettered as shown in the image on the left. It measures 16"x20". The image on the right shows the design enlarged. It uses cut papers and Prismacolors. "Whenever you receive the body and blood of Jesus in the Eucharist his love is given to you, the same love he showed on the cross. It is the love of God for all people of all times and places, of all religions and creeds, all races and classes, all tribes and nations, all sinners and saints." 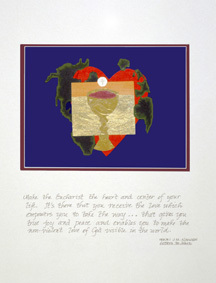 This 16"x20 collage has the text hand-lettered beneath the image and also in the chalice. 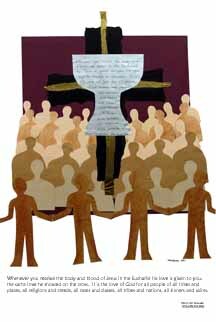 The paper doll figures are cut, colored and arranged to represent groups of people, all loved by God. "What we are called to do are actions that bring us true joy and peace. Actions that lead to overwork, exhaustion and burnout can't praise and glorify God. What God calls us to do we can do and do well." This collage is three-dimensional. 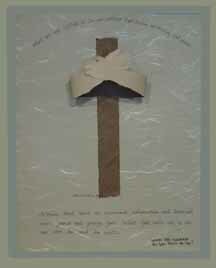 The arms of the cross are formed by overlapping human arms. This 16"x20" collage is in a natural blonde wood shadowbox. "It is remarkable how easy it is to bless others, to speak good things to and about them, to call forth their beauty and truth, when you yourself are in touch with your own blessedness. The blessed one always blesses." This collage is 16"x20". The priest's sleeve and the shirt of the blessed one melt into the background. 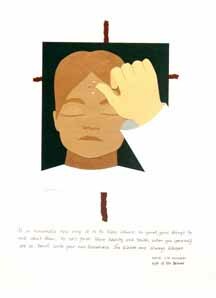 On the forehead of the child are tiny gold dots representing the blessing. "Loneliness is painful; solitude is peaceful. . . Solitude allows us to respect others in their uniqueness and create community." This college measures 20"x16". The jagged portion on the left represents the uncomfortable experience of loneliness. In contrast, the horizontal bands of blue with the collection of circles suggests a community of peace. "You wonder what to do when you are attacked on all sides by seemingly irresistible forces, waves that cover you and want to sweep you off your feet . . . . Make the conscious choice to move the attention of your anxious heart away from those waves and direct it to the One who walks on them and says, 'It's me. Don't be afraid.' "
This collage is 16"x20". 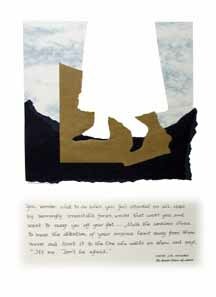 The robe and feet of Jesus are negative space, shaped by the other papers. 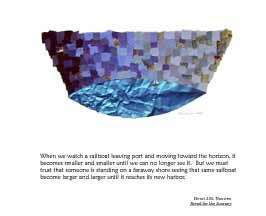 "When we watch a sailboat leaving port and moving toward the horizon, it becomes smaller and smaller until we can no longer see it. But we must trust that someone is standing on a faraway shore seeing that same sailboat become larger and larger until it reaches its new harbor." This collage is 20"x16". The water is made of crumpled paper, slightly smoothed on the right side. The sky is made of a mosaic of blue and gold torn papers, gradually moving from dark to lighter. The sailboat is barely visible. In the collage the text is hand-lettered, not computer generated as in this image. "As we look at the barren trees and remember those who have died, let us be grateful for the beauty we saw in them and wait hopefully for a new spring." The ground is torn paper, the trees, sky, and vault of heaven are cut papers. 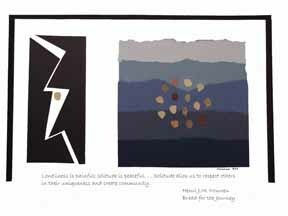 This text is also used in the collage titled, "As we look," found in Nouwen Gallery 3. The members of the community are shown in their tie-dyed diversity holding hands around the central heart. In the original collage the text is hand-lettered. Also available in print or card form. "Contemplative prayer can be described as an imagining of Christ, a letting him enter fully into our consciousness so that he becomes the icon always present within our inner room." The blue head seen in profile is made from different blue papers, shaped like the walls, floor and ceiling of a room. On the back wall hangs an icon of Christ on the cross. "If we keep choosing silence, a circle of friends to speak with, and actions that flow from our call, we are in fact drinking our cup, bit by bit, to the bottom. The sorrows of our lives will no longer paralyze us, nor will the joys make us lose perspective." 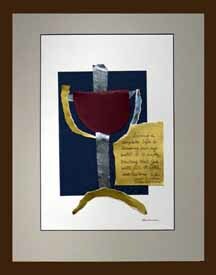 This 16"x20" collage shows the circle of friends surrounding the rim of the chalice. 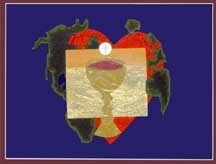 The wine in the cup is also flowing from the base to represent the flow of actions connected to our call. "In prayer we are constantly on the way, on pilgrimage. On our way we meet more and more people who show us something about the God whom we seek." The labyrinth in this 16"x20" collage is formed with very tiny pieces of colored paper. The outer border of the labyrinth has those same colors of paper in large pieces, then covered with rice paper. In the original collage the text is hand-lettered. In this 16"x20" collage the areas of color spiral to the center in increasing values. The spiral is interrupted by the cross that isn't there (just playing with negative space, again). In the original collage the text is hand-lettered. "Together in the one mosaic, each little stone is indispensable and makes a unique contribution to the glory of God. That's community, a fellowship of little people who together make God visible in the world." On vacation I collected tiny rocks from the beach which I categorized by color and value. Then I used them to create the face of Jesus. If even one stone were missing, the picture of God would be less comprehensible. We are all important! This 16"x20" collage comes in a gold shadowbox frame. "We have to dig deeper into our spiritual resourses and find the center within us, the center that lies beyond our need to hurt others or ourselves, where we are free to forgive and to love." The figure in this 16"x20" collage is composed of many layers of translucent paper, making the outline blurry, and giving some movement around the heart. "We stop wondering whether our live is better or worse than others, and start seeing clearly that when we live our life for others we not only claim our individuality but also proclaim our unique place in the mosaic of the human family." The mosaic here is composed of small torn paper ovals in a variety of skin tones, no two of which are alike, though all have much in common. The collage is 16"x20".